Experience the best of responsible tourism at The Lodge at Feline Fields in the heart of the Kalahari. The Botswana-based Lodge places sustainability and eco-tourism at the heart of its operations with the non-profit Feline Fields Trust, which aims to shape the future of conservation in Botswana. Built in a remote part of the Savannah, The Lodge at Feline Fields is located west of the Okavango, in the stunning Kalahari Desert. Inspired by owners Raphael and Marjan del Sarte’s dream to give back to the natural environment, the luxury six-suite safari lodge focuses on low-volume eco-tourism with Feline Fields raising funds for the Feline Fields Trust. This eco-tourism benefits the surrounding environment and communities, with local youth able to spend time at the Lodge learning about careers in eco-tourism and conservation. Staff are all paid above the average local salary. Guests looking to enjoy the luxury of the Lodge can relax guilt-free in the knowledge that it operates on 80% solar energy, with the aim to soon have this at 100%. The Lodge’s new luxury mobile camp in Mababe Marshes allows visitors to experience a unique safari rich in wildlife sightings, whilst leaving no lasting trace in the Okavango Delta. Feline Fields has successfully combined low-impact and community-enhancing tourism with luxury travel in the most beautiful location. Founded in 2015, before the opening of the Lodge, the Feline Fields Trust facilitates sustainable conservation. With a focus on leadership development and education of rural children in Botswana, the trust has provided the surrounding community with a safe space to have fun and learn. 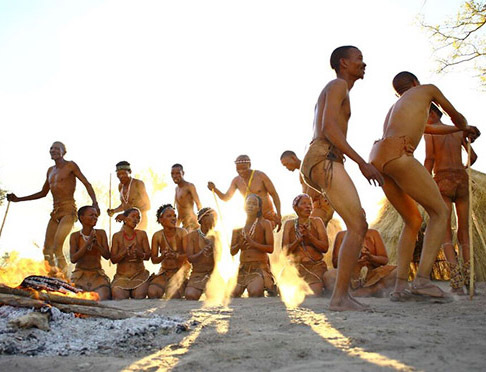 This is the first chance that many local Bushmen children have had to experience such a facility. The trust’s team also run a free daily minibus service to the school, which was recently upgraded following generous donations. Running six times a day from Sexaxa village towards Matalapaneng school, this minibus saves 70 local children a day from walking the 20km round trip, allowing them to dedicate this extra energy to their studies. Feline Fields offers guests the chance to participate in the Bokamoso Volunteer Programme which welcomes volunteers from across the world for periods of up to three months at a time. Volunteers split their time between The Lodge at Feline Fields and the Feline Fields Trust projects in nearby Maun and Tsao. Volunteers help organise local events and educational talks and work with experienced guides to monitor the local wildlife activity. For holidaymakers or enthusiasts looking to make a difference, the Bokamoso Volunteer Programme provides a unique insight into this extraordinary environment and is a valuable opportunity to directly contribute to the future of conservation in Botswana.